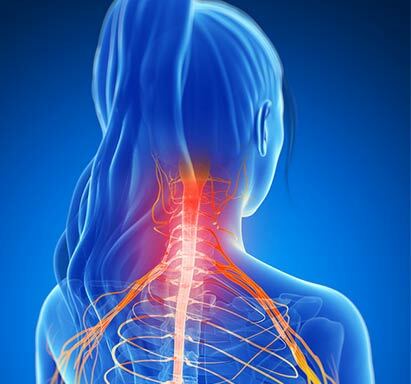 A cervical radiculopathy is a problem that results when a nerve in the neck is irritated as it leaves the spinal canal. This condition usually occurs when a nerve root is being pinched by a bone spur or a herniated disc. When a nerve root leaves the spinal cord and the cervical spine, it travels down into the arm. Along the way each nerve supplies sensation (feeling) to a part of the skin of the shoulder and arm. It also supplies electrical signals to certain muscles to move part of the arm or hand. When a nerve is irritated or pinched, by either a bone spur or a part of the herniated disc, it causes problems in the nerve. A cervical radiculopathy causes symptoms that radiate out away from the neck. What this means is that although the problem is in the spine, the symptoms may be felt in the shoulder, the arm, or the hand. The symptoms will be felt in the area where the nerve that is irritated travels. By looking at where the symptoms are, the spine specialist can usually tell which nerve is involved. The symptoms include pain, numbness and weakness. The reflexes in the upper arm can be affected. It is always wise to try conservative measures for this problem before considering the surgical route.